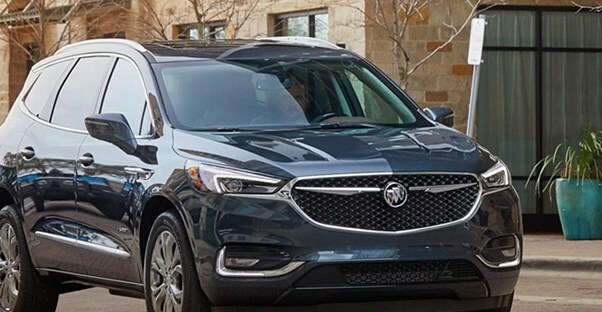 Which 2019 Buick Enclave Is Right for You? The Preferred has a starting MSRP of $40,995 and has plenty to offer. Its 3.6L V6 SIDI VVT engine gives it 310hp and 266 lb-ft of torque. It has automatic on-off headlights, as well as daytime running lamps. The interior is also packed with features that make this trim great for the price point. Buyers find heated, six-way power-adjustable front seating and enough room inside for seven passengers. The entertainment system includes a USB port and Buick’s standard audio system. It also includes Buick’s infotainment system which has Bluetooth connectivity, an eight-inch color touchscreen, SiriusXM radio, CD player, MP3 playback, and an auxiliary input jack. Standard with the Enclave is Apple Carplay and Android Auto, which allow your phone to connect for easier music and maps. There's also a built-in 4G LTE WiFi hotspot. It’s easy to keep passengers safe in the Buick Enclave thanks to the automatic occupant sensing system which lets you know if passengers don't put on their seatbelts. The Enclave also includes remote keyless entry, a remote vehicle starter system, and rear parking camera assist with audible warnings.